PRETTY PERKS...#30. 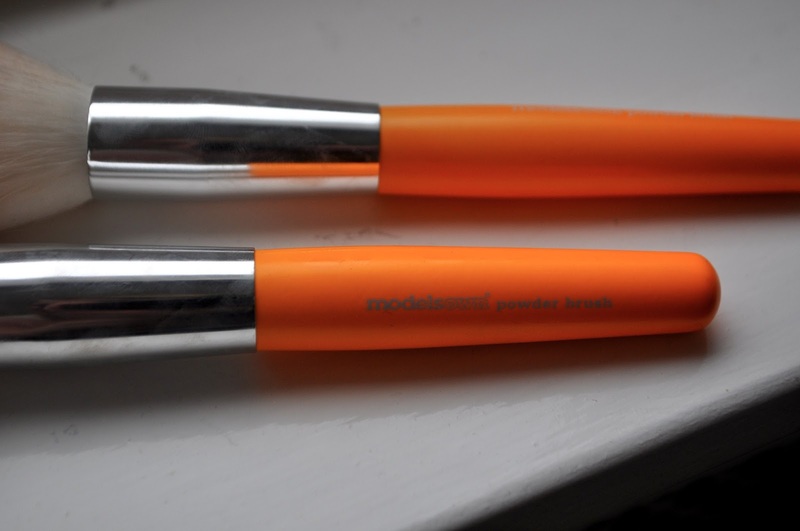 MODELS OWN POWDER BRUSHES. | Life Looks Perfect. PRETTY PERKS...#30. MODELS OWN POWDER BRUSHES. Since then I have been on the prowl to purchase some lovely new makeup brushes, Becki having already reviewed the amazing Real Techniques brushes (review HERE) and Liz Earle brushes (review HERE) I thought I would check out and see what else is on the market at an affordable and reasonable price. And here they are the raver of all make up brushes! A fantastic purchase from Boots, Models Own Powder Brush. Just so there is no confusion, these were both sold separately and retailed around £11 each. I don't think it is hard to believe the reason why these brushes as they stood out on the shelf. It was purely due to their amazing stand out colour why I picked them up. Bright, bright neon orange whoop whoop! They are like little glow sticks! I have absolutely fallen in love with them. They are so soft and smooth when applying a product to the skin and unlike my awful previous purchases they haven't shed any bristles woohoo! As I bought two of the powder brushes, I use one for blusher and the other for applying bronzer. Rather than purchasing the blusher angled brush, I prefer the cylindrical shape when using a blusher, as I find it gives a natural look, rather than an unnatural 'stripe' effect which you may get with some brushes. 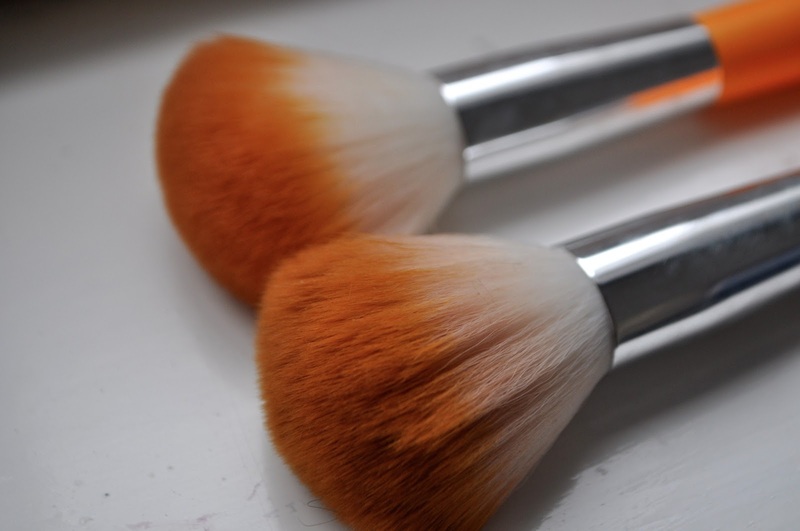 I also find the shape of these brushes makes it very easy to blend your makeup, especially when contouring the face. 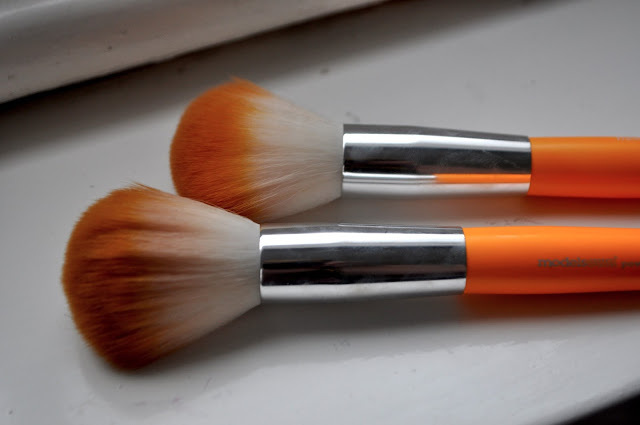 The brush is a nice size and weight, so it feels sturdy when I'm applying makeup. I can't even explain how lovely and soft the bristles are, honestly they are silky soft and don't irritate the skin at all. They seem to pick up the perfect amount of product too. The only downside I can think of is that the orange tipped bristles can make it hard to see how much product you have on the brush but as I said before it never seems to pick up too much anyway.